It's my mom's birthday today. She would have been 70, but she died of pancreatic cancer 10 years ago when she was only 60. I miss her. It's a rainy day today in the Bay Area, but I feel cozy in my home with a candle lit in her memory, reviewing photographs taken of the two of us during different stages of our relationship. She is still with me. In the photo above we are performing at a church Valentine's talent show. She is the 70's version of Patti Page singing "How Much is that Doggie in the Window." I'm the doggie of course singing the "arf-arf" chorus. 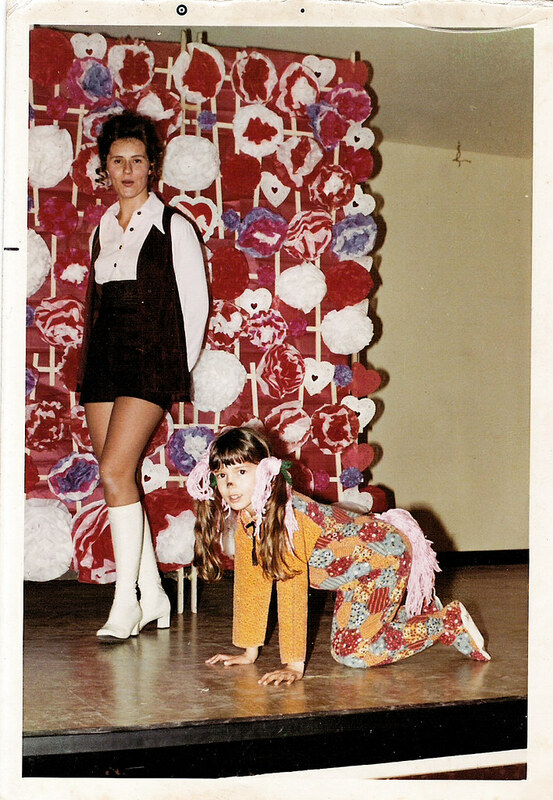 I'm vaguely sure our "singing" was in the form of lip-synching, but I do have a distinct memory of my mom teaching me to make the tissue paper flowers that decorated the stage in the basement-level, fellowship hall of Seventh Street Christian Church in Richmond, VA. 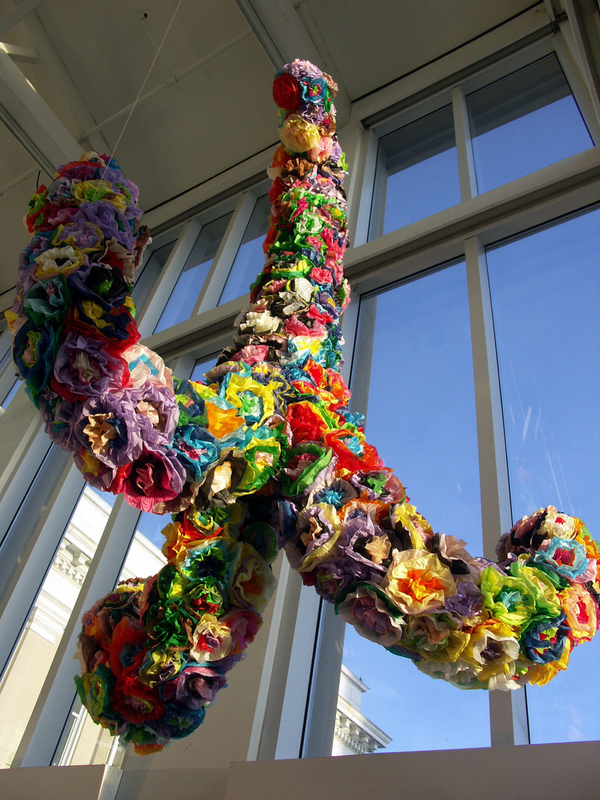 This memory of my mom spurred a temporary public art project that I produced, funded, created, and performed for the city of Durham, NC in 2005, a year after her death. The city of Durham was entering a first phase of rapid redevelopment and urban renewal at that time. Lots of things were beginning to change. Renewal of the city center was something everyone hoped for but there was also a sense of loss. On a personal level I was thinking a lot about the nature, and meaning of hope in the face of grief and death. The Piñata Anchor of Hope combined two cultural symbols of hope, the "anchor"--the hope for stability during rough seas, the "piñata" --the hope for the prize, with a third natural metaphor for hope --the "seed." I had to get permission from city hall and local business owners to site the project on the long abandoned empty lot in the town center where the old Woolworth's building used to stand. I worked with children from several downtown after school programs and magnet schools to create the piñata. Friends provided sweat equity, gardening expertise, and their creative talents. Horse & Buggy Press designed and donated beautiful letter pressed posters. I had fundraisers. Poets read and drummers drummed at the public ceremony. The community was involved in the watering and maintenance of the garden. It was written up in all three of the local papers. So many creative Durhamites pitched in to make our community unique and this project happen. Unbeknownst to everyone but my sister, who traveled to Durham to help me pitch the anchor off of the three-story building, a handful of my mother's ashes were mixed with the wildflower seeds. I remember thinking that the anchor falling through the sky was like the body of my dead mother. I recently heard from one of my Durham friends that construction of a 26-story apartment complex on the old Woolworth's lot is in the process of being approved by city hall. I am pleased that he recalled the blessing of that de facto public space, the abandoned lot in the center of the city of Durham, eight years earlier. Ten years ago today my dad, sister, brother and the rest of the family were celebrating my mom's 60th knowing it would be her last birthday. This is a picture of Dad, Sis, me and my dad's second wife, Ruth, on Alameda Beach just two days ago. They were visiting from North Carolina all last week. We had a wonderful time together. We thought of mom and missed her. Oh how life mysteriously generates and goes on!